SEA Russell Wilson still has only four passes completed, compared to NE Tom Brady's 20. Wilson has 84 yards and a touchdown, Brady has 177 yards and two touchdowns. SEA WR Chris Matthews has made only two receptions in his NFL career: the 44-yarder that set up Seattle's first touchdown and the game-tying TD just before half today. Not a bad way to kick off a career. Seattle was beating the Denver Broncos 22 - 0 at this point in last year's Super Bowl. They went on to win 43 -8. Brady and the Patriots looking to shift the momentum back their way. They're looking at 3rd down and 6 yards to go with 10:09 left in the 3rd quarter. NE TE Gronkowski gets the 1st down. Two quick plays later and the Pats are looking at another 3rd down. The penalty came after the pick, so Seattle keeps the ball. Tom Brady throws an intercepted for the second time today. 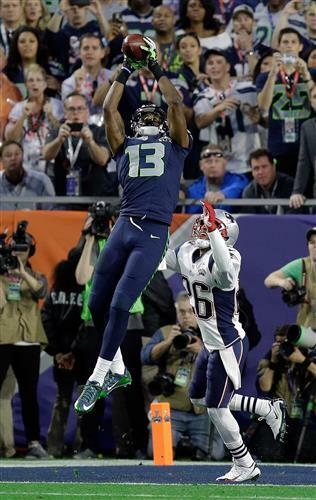 SEA WR Chris Matthews makes another catch. Matthews was the 2012 CFL rookie of the year with the Winnipeg Blue Bombers. Seattle is really taking it to the Patriots now. QB Wilson runs 15 yards, Lynch runs another 14. The Seahawks have the ball on the New England 4 yard line. SEA WR Doug Baldwin is left wide open in the endzone to put the Seahawks up 24 - 14. 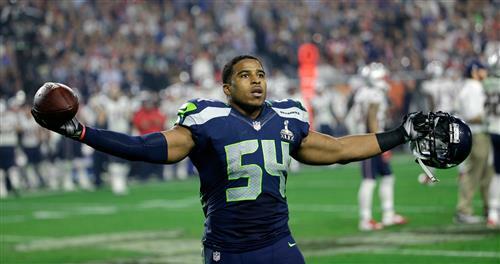 The second half Seahawks are looking like the first half Patriots, minus the turnovers. It took about 25 minutes for SEA QB Russell Wilson to complete his first pass. Fifteen minutes later he's got 141 yards and two touchdowns. And SEA RB Marshawn Lynch is in full beast mode, totaling 88 yards and a score on 19 carries so far. There's 4:48 left in the third quarter. New England has the ball back, trying to narrow this 10-point gap. Brady completes a pass, which is called back on a 10-yard penalty. New England forced to punt. Seattle gets the ball back with 3:15 left in the quarter. SEA QB Russell Wilson throws an interception on the 1 yard line. Incredible play call more than likely costs Seattle the championship. The only chance Seattle had at getting the ball back was stopping Brady from getting out of the endzone. And the Seahawks get a penalty for jumping the gun. Game over. But not before a brawl. Flags flying with 0:18 left. SEA Bruce Irvin is ejected from the game. The rest of the Seahawks are just dejected. NE Malcolm Butler was the defender who gave up the catch that should have won Seattle the game. And then Butler made the interception on the goal line, winning the game for New England. That's a wrap for the Super Bowl live blog and the 2014/2015 NFL season. The scoreless first quarter failed to foreshadow what was overall an exciting game of football. NE QB Tom Brady now has the record for most TDs thrown in the Super Bowl, the Patriots tied the record for largest Super Bowl comeback victory, and Seattle might have set a record for most terribly incorrect play call with that game-losing interception.